MyRestaurantTheme is a great solution if you are a restaurant owner in need of a great, responsive WordPress restaurant theme. It is a complete, full-package restaurant template for WordPress and it comes in several gorgeous designs for different restaurant niches. One of them is the Asian theme, a responsive Asian restaurant theme for WordPress. The Asian theme brings out the true spirit of the orient with an attractive layout and nice set of options. The set of colors is carefully chosen to match the nature of your restaurant. The homepage is enriched with a wide eye catching slider where you can spotlight anything you want through quality photos. The menu is very easy to create and it comes in categories. It can be shown on the homepage in a slide form, which makes it very modern and attractive. There is also a small slider reserved for your featured dishes. You can have photos of your daily specials rotating here, and by clicking any of them, your visitors will be taken to full page content where you can introduce them properly to the featured dish. Chef’s recommendations will also look great on your homepage, you can have your chef chose his favorite dishes and present them on your homepage with thumbnails and a bit of a teaser text showing. Again, when they click on a certain dish, your guests will be taken to another page where you can tell them all about the meal. 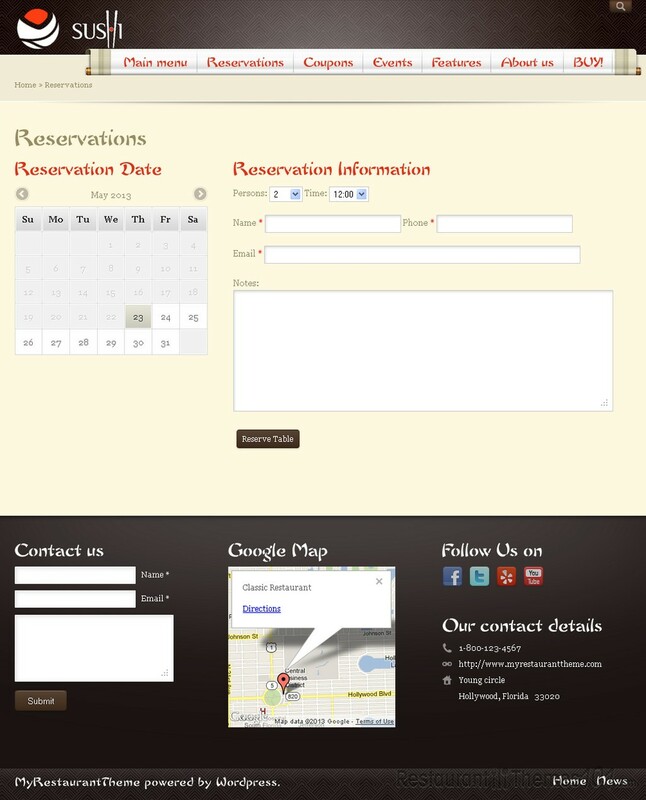 This theme features a reservation form, which makes booking a table very easy and very quick. Asian theme, just like the other MyRestaurantThemes features an integrated coupon system which will get you more customers, sales and social network shares. While we’re at social networking, let’s not forget to mention this theme has excellent social integration which allows you to connect your website with the most popular social networks. You can also let your visitors know everything about your upcoming events thanks to the great event system this theme features. Advanced customization and extreme ease of use make this theme easy to run and modify, even if you aren’t a coding expert.